Stan V. Griep is a freelance writer specializing in roses. He has been a Colorado Native Rosarian for 40+ years. Stan is an ARS Certified Consulting Rosarian and a member of the Denver Rose Society, the Loveland Rose Society, and the American Rose Society. 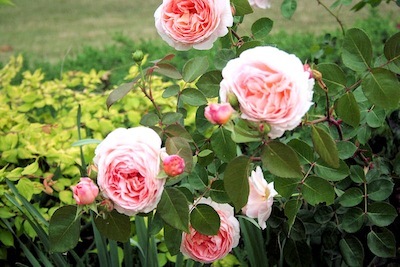 Two very important aspects to growing good, happy, and healthy roses are feeding them and watering them well. Next month we will talk about watering. Today, I want to talk about feeding not just the roses but also the soil around their roots. Feeding our rosebushes enough, truly giving them all the nutrients they need, is of great importance if we want healthy rosebushes that produce a bounty of wonderful blooms. There are just about as many rose foods or fertilizers available these days as someone can think up a name. Some of the rose foods or fertilizers are organic and will not only have food for the rosebushes in them but also materials that enrich the soils. Enriching the soils as well as taking good care of the microorganisms that dwell therein is a very good thing indeed! Healthy well-balanced soils allow the root systems to take up all the required nutrients better, thus creating a happier, healthier more disease resistant overall rosebush. Most chemical rose foods/fertilizers have what is needed for the rosebush but require a little help with the materials to enrich and build the soils. Using some alfalfa meal and kelp meal along with the food/fertilizer of choice is a great way to give both the rosebushes and the soils some important nutrients. Along with adding the alfalfa meal at the time of first (spring) feeding or my last feeding of the season (no later than August 15th in my area), I will add some super phosphate and potash. Generally, in my opinion, you want to look for a rose food/fertilizer that has a well-balanced NPK rating no matter what brand or type it may be. Making the decision as to which product to use becomes one of personal choice. When you find something that works well for you, stick with it. The main thing is to keep the rosebushes well fed and healthy so that they have plenty of stamina to make it through the winter/dormant season as well as blooming nicely for us during the growing season. A very good organic rose food locally in Colorado is one called Mile Hi Rose Food. It is available from most local Rose Societies for purchase, as well as some area nurseries or greenhouses. Another good organic based rose food that I really like is Gro Rich Rose and Perennial Food, carried locally by garden centers and nurseries. Cornmeal is another “additive” that can be mixed in at the time of feeding the roses. There has been some research conducted that shows the cornmeal attracts a good fungus that tends to get rid of the bad funguses (such as; Black Spot) that try to attack our roses. Add 1-cup of cornmeal around the big roses and ½ cup around the miniature roses at feeding time. Twice a season should be sufficient. Some folks like to make a spray solution out of the cornmeal to spray on their roses as a foliar treatment. Make the cornmeal spray solution by soaking 1 cup of cornmeal in a gallon of water. Put the cup of cornmeal into an old nylon stocking and dip it into the gallon of water (kind of like a tea bag as used to make tea) and let it steep overnight, to help keep the end solution cleaner for use as a spray. I tend to stay away from the “systemic” rose foods/fertilizers. Not because they do not have all the nutrients needed for healthy roses, but because the chemicals in the systemic type foods/fertilizers concern me. I have stated in other articles that I do not want to drive away any of the worms or microorganisms in the soils around my rosebushes, as they are a major component of what make the environment suitable for my roses to thrive. Since I have no well-founded proof that these products will not have a negative impact on my rosebushes soils’ environment, I see no reason to take the risk of using them. Marketing information provided is one thing, actual effects on the overall soils’ environment is totally another matter. I have not run into any situation where the systemic route was truly the only way or the best way to deal with any particular problem. In our busy lives, we want something simple, quick, and easy to do most chores. Thus, there is more time for enjoyment and less time having to work or spend the nurturing time. Some parts of that thought process are okay while other parts carry some very real problems in the long run. So, as not to get too far onto a soapbox, I will let you make up your own mind on the products used. Just be careful with the products you choose to use, spend some time not only reading the how to apply portion of the label but the entire label, preferably before buying the product. You might just be amazed at what you were about to use on your wonderful rosebushes or place into their “root zone” environment. Remember to water your rosebushes well either in the early evening or morning before application of any pesticide, and I recommend before feeding time as well. Water your rosebushes well again after feeding; they will love you for it. The time you spend tending to your roses will bring forth equal rewards. Even if you call it “working in the garden,” it is work that brings forth many a blessing as well.